which is in what is now Eastern France. as well as their treatment of those who had skin diseases. 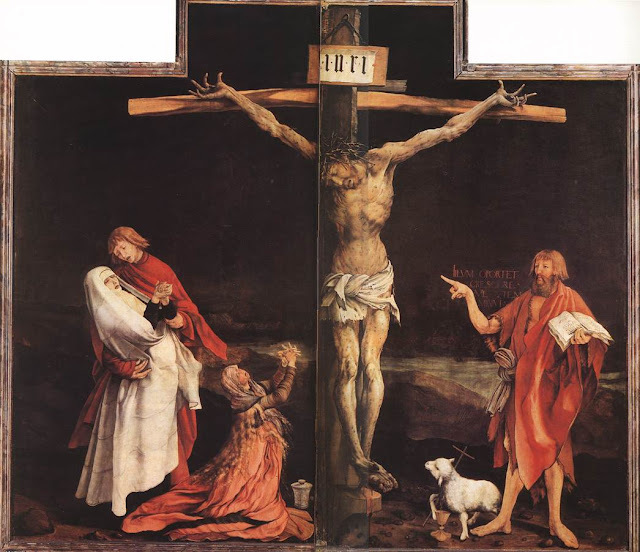 Did I say that Grunewald’s painting is a masterpiece? Maybe so, but up close it is horrible to view. Jesus’ arms are unnaturally long, stretched to the breaking point. His fingers, nailed through, are splayed out. His ribs stick out from his body, as if he had been starved. and his body begins to fill with poisonous toxins. He bleeds profusely from his head, the crown of thorns piercing his brow. Christ’s body is covered with open sores and lesions. from the daily joys and work of the world. in pain of body, mind, and spirit. The powers of the world had left them alone. They could give no glory to the powers of the world. in his pain and sorrow giving them a blessing. What does it take to see Jesus as the king of the universe? an object of brutality to the violent? and are afflicted by life. and to shepherds that betray us. and deceived by those who abuse the truth. and death separates us from our very selves. the two criminals who were put to death with Jesus. sees something else in the man before him. Somehow there is a hidden majesty in him. and surely somehow he will receive it. the king of the universe? we will see his love for us. is the one who holds the key to Paradise. who will make all war to cease upon the earth. who is exalted by people of all nations. He makes them one in his body, the Church. has revealed himself at last to us, for us. Jesus, remember us when you come into your kingdom.